With the mPOP Star offers an innovative solution for the POS of the next generation. The combination of cash drawer and POS printer in chic housing contains the two major building blocks as the basis for use at the POS in retail and hospitality. With its compact dimensions of just 30 x 30 x 10 cm and the built-in Bluetooth connectivity, the mPOP quickly finds its place among and on any desk, and provides stable connection to the POS application on any mobile device. With the mPOP Star offers an innovative solution for the POS of the next generation. The combination of cash drawer and POS printer in chic housing contains the two major building blocks as the basis for use at the POS in retail and hospitality. With its compact dimensions of just 30 x 30 x 10 cm and the built-in Bluetooth connectivity, the mPOP quickly finds its place among and on any desk, and provides stable connection to the POS application on any mobile device. mPOP supports all major operating systems such as Windows, Linux, iOS and Android - whether stationary or mobile. This opens up the option for waiters, for example, to serve customers with just a single device at the table or at the checkout counter. Simple upgrade to a POS system with a tablet, barcode scanner, etc. The integrated printer with the reliable Star print mechanism offers reliable printing at 100 mm per second it produces receipts, tickets and sales slips with a width of up to 58 mm. Media change is simple applying gentle pressure on the front is enough to open the printing unit. Thanks to an intuitive top-loading mechanism, the role is changed in seconds and the cashing process may immediately resume. This maximizes satisfaction for each waiting customer. 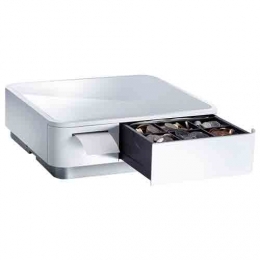 The concept of the integrated cash drawer is designed for full functionality and flexibility front output, 4 vertical banknote holders, 6 or 8 removable coin compartments, an extra compartment for other banknotes and cancellation documents - all integrated into compact glossy plastic housing. The electronic locking mechanism opens by software approval, so that lost keys are now a thing of the past. The mPOP supports multiple mobile devices and provides 4 USB ports 2x 1.5A, 2x 0.5A on the bottom, for charging smartphones, tablets, etc., or for other peripherals such as the optional mPOP barcode scanner. The lower-side cable management prevents cable tangle. The scope of delivery includes a cold cable, sample roll, a mounting option and a thin double-sided stand for a tablet and smartphone - a fast start-up is assured. Another handy feature of the Star mPOP is the optional backup by a Kensington lock.